Confession time. I kiiiiiiind of have a lady crush on Jessica Alba. I’m not only talking 2015 ethicalconsumerism advocate Jessica Alba. I’m also talking late 90’s classics Never Been Kissed and Idle Hands Jessica Alba. Though we can all excuse her for Honey, right? We can’t win ‘em all. Since working with Rachel Zoe then Brad Goreski and then famously dumping poor Brad for the creative heads of Current/Elliot, her style has been pretty darn flawless, don’t you think? It’s kind of a boho-chic and I’m digging it a big fan. (Do people say digging it IRL? I don't.) While I don’t foresee spending close to $500 on Charlotte Olympia flats anytime soon, I can re-create some these looks with elevated staples (like an oversized black blazer) or loose flowing silhouettes. Or I could pick up her favorite Casual Petra bag which is finally back in stock. 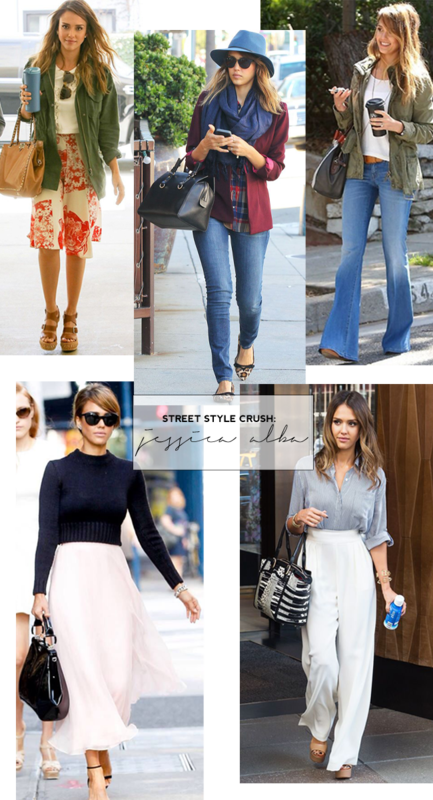 Who are your celebrity style inspirations?